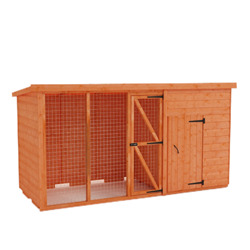 Find out more about our Pethouse and Run range. Finished with our classic red cedar treatment and made with our superior shiplap tongue and groove cladding our Pet house and run has been made to challenge preconceptions that a low price means low quality. The secure enclosure allows your pet to move freely between rooms whilst unattended without causing damage to the interior of your home.